I'm very pleased with the Miele C3 Kona vacuum. It is quiet yet powerful. The attachments are easy to interchange when going from oriental rugs to wood floor. The adjustable suction power buttons also make it easy to change the motor power when transitioning between floor types. I wasn't sure what I'd think about pulling a canister behind me (I've only had upright vacuums previously), but the caster wheels, even on the carpet, make moving it easy. 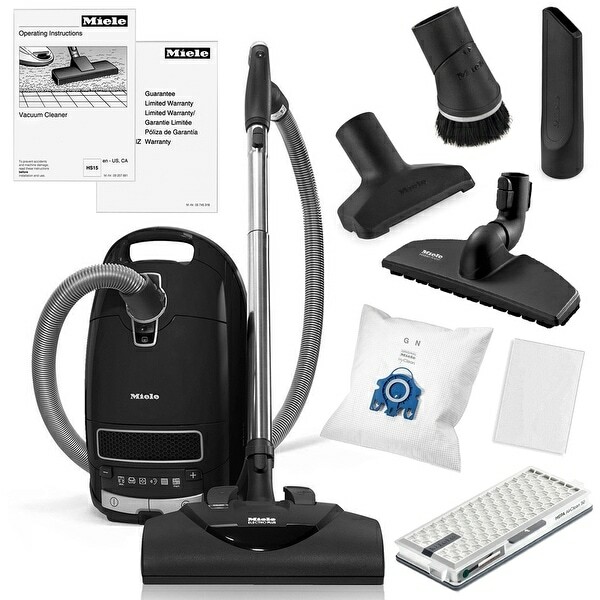 Though it is pricey compared to a big box store vacuum, the Miele vacuums are notorious for lasting over twenty years. The motor and body have a seven year warranty. The three stage filtration system is one of the finest available. And as stated before, it's easy to use. Customer ratings and testimonials are also very consistent as making this brand the wisest investment to purchase. After much research, I chose the C3 line because it has a longer power cord, a longer hose, the best filtration system, the electric-powered rotating brush attachment, and it has a larger body which houses a large bag filter and three attachments inside. The Kona model is one of the lower priced models in the C3 line. The Miele C3 Series A perfect synergy of design and functionality, Miele's C3 series sets new standards in floor care. These full-size canisters combine maximum features and efficiency with outstanding cleaning results. Superior engineering is balanced with carefully-selected, fine quality materials such as a durable stainless steel wand and specialized ABS plastic with a hard, impact-resistant surface. The C3 series features innovative skeleton construction, making it 2 lbs. less than the S5 series. Other conveniences include a 36-foot operating radius and foot pedal controls for quick and effective cleaning. C3 also features a silence motor to maintain a quiet environment, and an AirClean Sealed System that not only vacuums your floors - but also cleans the air your family breathes. Kona Miele's C3 Kona vacuum cleaner features an Electro Plus electrobrush. With a five-level height adjustment and an independent motor, the Electro Plus delivers the ultimate in cleaning power. A perfect choice for larger rooms with medium to deep pile carpeting. The Kona also includes the Parquet Twister - providing 180&deg; rotation for the agile, yet gentle care of smooth surfaces. A telescopic, stainless steel wand and long electrical cord, with one-touch automatic rewind, provide a total cleaning radius of 33 feet. The C3 Kona is also equipped with a Deluxe Comfort Grip handle and six-stage suction control via a +/- foot switch. Other conveniences include three integrated accessories - a dusting brush, upholstery tool and crevice nozzle - and a 3D bumper. Best vacuum I’ve ever had. I was apprehensive about spending this much for a vacuum after reading the reviews, I made the decision to try it. I'm glad I did as this is the best vacuum I've owned. Great cleaning ability, light weight, very solid construction, and super quiet. We owned a Dyson animal previously and this thing beats it in all areas. I still have not received this item. I am awaiting a response from the seller to see if they can prove delivery and where my vacuum cleaner is located. $ is a lot of money, never to receive the item. I will keep you posted.